1.Prepare Lemon-Chive Oil: In blender or bowl of food processor with knife blade attached, purée all ingredients 30 seconds or until chives are finely chopped, scraping sides of blender occasionally with rubber spatula. 2.Prepare Beet, Orange & Chèvre Salad: Preheat oven to 375°F. Rinse beets under cold water and pat dry. Rub beets with oil, salt and pepper. Wrap individually in foil and place on rimmed baking pan. Roast beets 1 hour or until tender and easily pierced with knife. Remove beets from oven and carefully open foil to allow steam to escape. Let stand 20 minutes or until cool enough to handle. Peel and dice beets. 3.Meanwhile, in small skillet, toast pine nuts over medium-low heat 5 to 6 minutes or until lightly browned, stirring frequently. Remove peel and white pith from oranges. Turn each orange on its side and cut into 1/4-inch-thick slices. 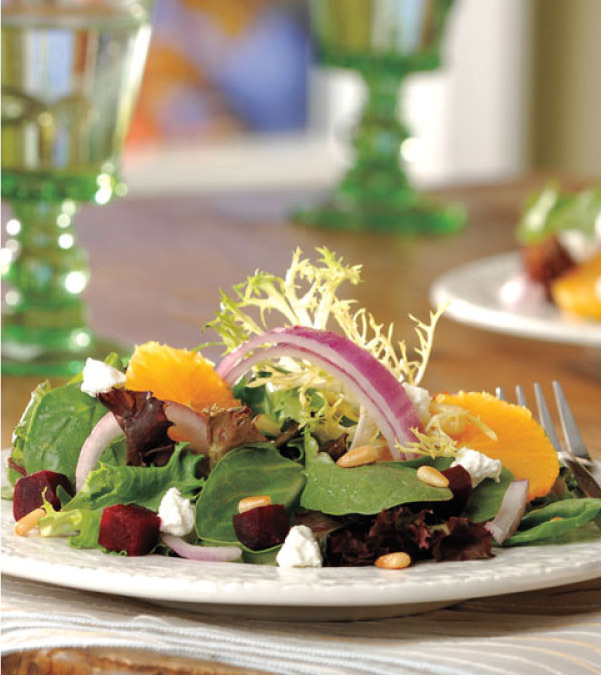 4.To serve, line large serving plate with spring mix, and place orange slices, beets and onion over spring mix. Drizzle with Lemon-Chive Oil and top with cheese and pine nuts. > To peel an orange, slice off top and bottom ends to form 2 flat surfaces. Place 1 flat side down on cutting board. With small paring knife, slice down the sides of the orange following the natural curve of the fruit, removing skin and white pith completely.